This review contains no substantial spoilers, beyond discussion of the basic set-up of the book’s plot and a few lines of dialogue taken out of context. Oh, reader. Dear reader. I wish I could be more positive today. I really do. When The Monogram Murders was published, reviving the Hercule Poirot series after four decades, I was ecstatic. Oh, sure, a cynic might argue that the Christie estate’s main motivation was to protect the character of Poirot from imminent copyright lapses, but even that couldn’t get in the way of a good story. And with well-regarded crime novelist Sophie Hannah at the helm, it seemed a savvy choice for the estate to choose someone with industry recognition to carry the story forward. I enjoyed Monogram with some reservations – an explanation for the murders that was breathtaking in its complexity but also seemed ill-suited to the Christie form; the narrative device of Catchpool’s first-person voice, keeping Poirot at something of a remove; a couple of silly one-dimensional characters around the edges – so I was disappointed when the sequel, Closed Casket, although still enjoyable, amplified all of those existing issues. The Mystery of Three Quarters, the third in the series, unfortunately cranks the sound system up to 11. Hannah’s greatest strength (as a writer of Poirot mysteries anyway; I’m sure she has other strengths in her preferred genre of psychological thriller) is the set-up. Each of her mysteries has an intriguing hook that successfully captures the reader’s interest. 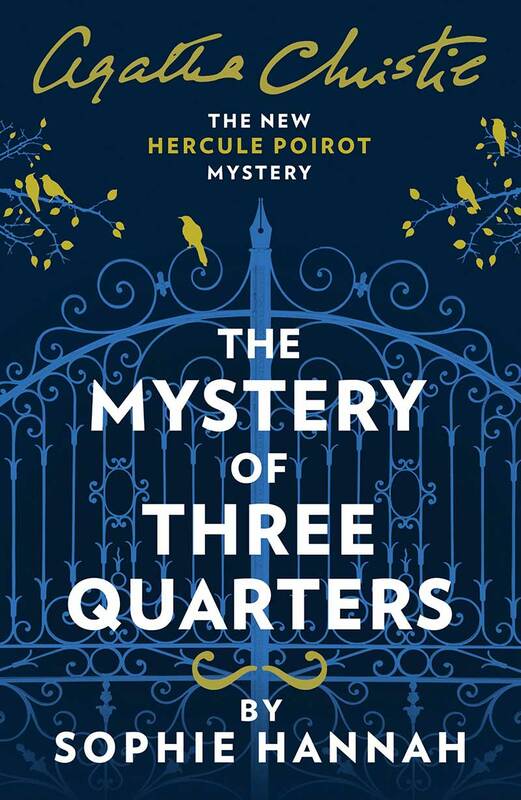 At the commencement of Three Quarters – as per the book’s blurb – Poirot is confronted by an incensed woman, to whom he has written a letter accusing her of killing one Barnabas Pandy. Later that day, he is confronted by a man – a stranger to that woman – who is outraged for the same reason. It turns out numerous people in London have received accusatory letters from the Belgian. The trouble is: the great detective never sent any such letter. What is going on? How do these seemingly disparate people connect? Was Barnabas Pandy really murdered? And why would anyone involve Hercule Poirot? The mystery is darned intriguing, but unfortunately that was where my positivity ended. Three Quarters turned out to be not only dull, but stunted. Like it was still in draft format. I’m sure a cynic out there might suggest that the book was being rushed along by Hannah, to fulfill the passing interest of the Christie estate while they lie on a four-poster bed throwing money in the air, thus allowing her to return to her actual passions. But I am not a cynic, so perhaps I will just hope this is an unfortunate occurrence. Where to start? The trouble is that the dullness in this novel is in the writing itself. Catchpool (still secretly gay, still terribly uninteresting) returns as narrator, but this time he sits out several chapters entirely. The vague conceit is that Catchpool has researched what happened, and is now reconstructing it, but no attempt is made to create anything interesting out of this. There is no experiment in form, and nothing comes from Catchpool being sometimes a third-hand narrator. This is not Don Quixote. Instead, we are treated to chapters where Poirot – or occasionally another character entirely – investigates, written in a generic omniscient style that includes his thoughts and feelings. On seeing the large print of my Harper Collins edition, I remarked jokingly to my partner that this was being written for people over eighty-five. After reading the novel, I began to suspect this book was targeted exclusively at those in aged care. It feels like there is a concern that Hannah’s complex plotting and superabundance of characters might be at odds with the mental faculties of the reader. The most peculiar recurring habit is lists. Without prompting, characters will say (names here just for example), “I was the only one home, aside from Tom, Mary, Jane, Albert, and Caroline”. Or, “He didn’t hate me, but he preferred to spend time with Elizabeth, Sarah, Lily, and Paul”. And then, interviewing another one of those characters will yield the same list. Poirot and Catchpool name every single suspect in list order about a dozen times, in what are otherwise normal conversations. By page 40, Poirot is recapping in his head the plot of those first 40 pages, which are then recapped again by Catchpool, and again whenever they meet someone new. I’m happy to do a bit of the thinking, if you’ll just leave me some, please! The dialogue – which perhaps will read as “period dialogue” to a certain kind of American – is woefully non-specific and often, again, feels like it has just been drafted. “We had a long and quite interesting chat”, says a teenage girl. “I was sad to lose my father”, says a 13-year-old, “That does not, however, invalidate my thoughts and observations on other matters”. There is no reason why children shouldn’t be eloquent (in a line spoken by that same 13-year-old, Hannah pre-emptively swipes at critics like myself for this very reason) but when any one of your characters could have spoken these lines, it suggests little attempt is being made to find character through dialogue. Now, of course, Christie was no Tolstoy. I doubt anyone would argue that case. But it’s clear that Hannah is not seeking to imitate Christie; there is a darkness at the heart of Catchpool, the suspects, and even Poirot – as there was in the hateful and haunted village of Great Holling in Monogram (my favourite of Hannah’s locations thus far) – that has come entirely from this author. And given that, I don’t think it’s a fair excuse to say that Christie’s plotting and character work were sometimes hazy. That’s Christie’s problem; these books are new. The trouble with all of these repetition and inanity is that so little time is spent on the actually important things. One character confesses to a murder – perhaps falsely – in a scene that appears out of nowhere and then fades away again. A young character receives startling news about someone they love, and then even more shocking news later in the book, and in both cases is denied anything approaching an emotional impact – but remains sitting in the same room without further description, so we’re left to imagine whether they’re slitting a wrist or just enjoying another cucumber sandwich. An unambiguous clue pointing to one of the suspects is found in the most unlikely of places, and then just added to the checklist, rather than causing any change in the status quo. What had bewildered me most about Closed Casket had been the lack of atmosphere. Despite being set on an Irish estate in an era of intense class and cultural upheaval, no-one felt remotely Irish, and the characters – forced to stay at the manor for several days while the crime was investigated – engaged in few interactions amongst themselves. No atmosphere, no ambience. Three Quarters also brings a bunch of characters together to stay at a country home overnight, and again we see precious little of comedic or dramatic value from this. Hannah continues her trend (at this point, I have to assume it’s intentional) of including one blatantly ridiculous character. In Monogram, it was the hotel owner whose only traits were to be Italian and possessive of his hotel. In Casket, it was Orville Rolfe, a morbidly obese lawyer who didn’t seem to understand that he was fat. (“They don’t make chairs like they used to!”, he would bluster after a chair broke underneath him. “They don’t make meals as big as they used to!”, he would cry after ordering a third helping.) These traits weren’t worth condemnation on their own, but as they were the only characteristics assigned to these supporting characters… well, it became very tired very quickly. Three Quarters introduces us to a “comedic” secretary whose only trait is that she’s obsessed with appointments. Someone is invited in to your boss’ office for an impromptu meeting? Hold the meeting up by demanding that your boss hand over the appointment book so you can make a note of it right now! Your boss hasn’t come out of his office for a suspiciously long time? Start screaming because he’s two minutes late for an appointment! It’s hilarious, alright. I rarely write negative reviews, as regular readers will know. I would prefer to analyse what has been presented and see what good can be found. But all of the above reservations can be comfortably situated inside the larger problem: this feels like murder by rote, or, more accurately, murder by video game. Everything – character, dialogue, clues, ambience – must be simplistic, like those surprisingly popular computer games where the player clicks around the room to “solve a murder” by finding items; a glorified Where’s Wally? Sure, Christie’s novels existed in an era when the “golden age” detective fiction was a bit like a jigsaw puzzle for the mind. Characters were dispensable, and no-one had to think to the logical conclusion: that it’s weird to have a happy ending when even the characters who are innocent were so clearly capable of being guilty. But the novels played by a set of rules. The clues had to play fair. For instance, if someone reports something the victim once told them, but gets it wrong, they can’t directly say that “this is what X told me”; the author has to leave some wiggle room for us to potentially, theoretically figure out that we’re hearing a misinterpretation. How you chose to cover up the con was part of the joy for the reader. Indeed, one of the rules was that the book had to be entertaining, not merely a slog to tick some clues off a checklist. And the characters were only lightly shaded in because everyone reading the books already knew people like that. It’s a bit like the novels of Anthony Powell, or the comedy of Fry & Laurie; we don’t need to know much about the characters, because we’re assumed to be au fait with the types of people they are, based on a few simple traits. If, instead, you’re playing with cardboard “period” characters, but giving them complicated circumstances and – often – quite dark backstories, you’re going to leave the reader with a painful sense of cognitive dissonance. I put down The Mystery of Three Quarters thoroughly disappointed, and not wanting to write a negative review. But, dear readers, I have been honest with you for many years now. It is my duty. Perhaps I am not even vilifying Sophie Hannah – I have not read her non-Poirot books, and I’m sure they are as wonderful as the fans say. What I am really vilifying is a broader capitalist urge to resurrect a detective, who has been comfortably sipping crème de menthe in the heavens for more than four decades, whom we can enjoy in dozens of novels and short stories (not to mention more adaptations than any reasonable person can handle), all to keep some copyright locked in. I don’t expect Hannah – or any future writer of Poirot – to be Agatha Christie; I doubt Hannah herself does. In fact, I don’t care whether we get Poirot in a cookie-cutter format, mimicking the Dame’s voice as close as possible, or whether we have a revisionist approach ala Sherlock. Whatever works. But it seems clear, from the lack of interest in period ambience to the constant narrative attempts to keep the Belgian at bay, that Hannah’s novels are Christie-esque only because that’s what the estate demands. She could just as easily whip these up in a modern setting, or any setting of her choice, with a queer cop, an arrogant detective, and a quirky cafe owner. Much like Dame Agatha herself removing Monsieur from some of her novels when adapting them for the stage, surprisingly little would be lost. Perhaps Hannah should create a new detective, and we can leave the man with his little grey cells – who, after all, was given an obituary by the New York Times in 1975 – in peace. Well put. I couldn’t have described my own dissapointment any better. Keep sharing your thoughts with us, you clever prince! For the third time I am very disappointed. I have too many reservations about recurring trends over the three books to list them here, apart from one that, tellingly, stands out for me: a reluctance to involve the main character (Poirot). When Poirot returns to the fray after a long investigation elsewhere, I get the constant impression that the author is uncomfortable with his presence. Oh, and one more: there are indeed a number of Christie plots that are somewhat illogical when taken apart, but Hannah’s three books are riddled with improbabilities at most turns. After three attempts, perhaps it is time to hand over the baton. Thanks, mrcust, your points are very valid! The prolonged absences of Poirot (most notably in Closed Casket, where he leaves Ireland for apparently weeks without us following him) really do suggest that Hannah feels that the character gets in the way of her approach to writing mysteries. And yes, while I admire the intriguing set-up of each of the three mysteries, the only way to solve them is through a complicated backstory stretching back many years, and secrets which – despite apparently being impossible to track down – are unveiled to Poirot, offscreen, late in the book. (See, for example, the revelation about Pandy’s will that is deliberately given by one minor character to another minor character because apparently the former wouldn’t share his secret with the detective, but then he clears up the matter with Poirot in a scene we don’t get to see! Bewildering!). Thanks for reading.